August, a petite, Italian BYOB at 8th and Wharton in South Philly, is one of the city’s hidden gems. Though I have a handful of friends that frequent the restaurant and, when dining there, it’s apparent many other tables are filled with locals who eat there weekly, it doesn’t receive a deserving fanfare that establishments created by an Iron Chef or tri-state restaurateur would. It hits the mark on characteristics many great and lasting restaurants have: the ambiance is romantic, it’s small without feeling exclusive, the chef and staff are friendly and warm, and the food is quite memorable. Beets are too pretty to not like. Ever since I had dinner at August (at the beginning of August, coincidentally), I’ve been craving their beet salad. Their chef, Mary Ann Brancaccio, has a way of harmoniously combining ingredients to bring elegance to even the red, earthy, root vegetable. I summoned the flavors I remembered, headed to the grocery store, and improvised a recipe that was inspired by my dinner. When the cashier was scanning my items she stopped, perplexed, when she got to the ingredient I was most excited to work with. “What are these?” she asked, holding up the beets. I felt disappointed and, admittedly, a little heartbroken that she seemingly had never allowed herself to experience the delightful and intriguing flavor of a dish in which beets truly shine. I didn’t take it too personally, as I started to realize beets are something you either love or absolutely hate, and to introduce someone from the latter group to a new perspective can be difficult. The dish I had at August would have been the perfect way to sway someone’s opinion, and I welcomed the challenge to creating something that was even half as good. Whisk together vinegar, honey and 1 tablespoon of olive oil in a small bowl and set aside. Heat remaining tablespoon of olive oil in a pan over medium heat; add beets and sauté until just soft, approximately 7 minutes. 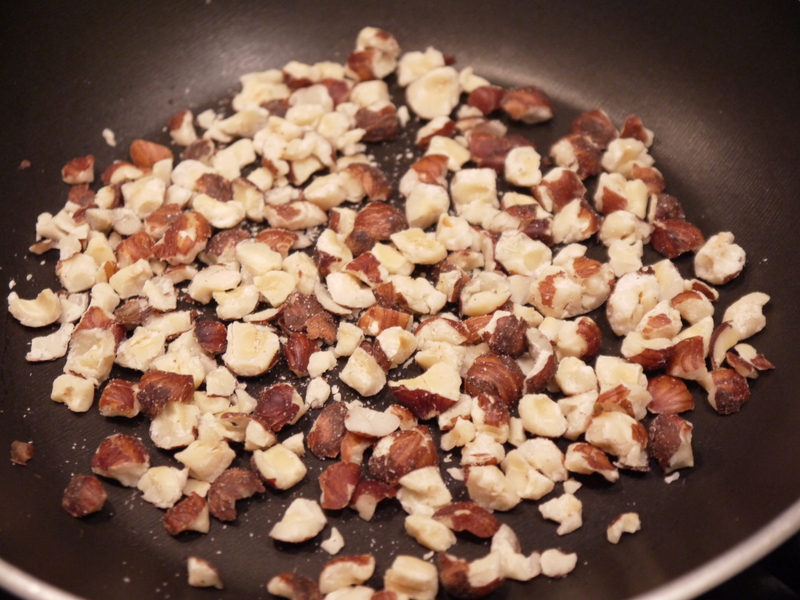 Remove to a medium bowl and toss in vinegar mixture, hazelnuts, basil and cheese. Season with salt and pepper, to taste. Serve warm or cold. The smell of toasted hazelnuts is intoxicating. 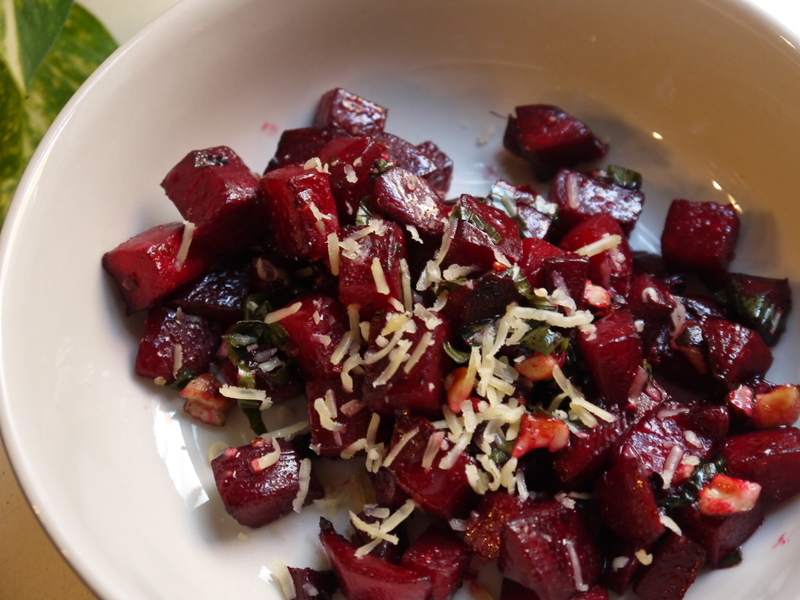 Beets are pretty versatile; pickled, roasted, boiled, or even sautéed in butter or oil, as in this recipe, they tend to star in almost every recipe they’re featured in. Their earthy flavor can be overwhelming to some, giving them a bad reputation among the haters; however, when cooked, they transform into a toothsome, mellow, somewhat sweet, and even attractive ingredient. The sautéed beets in this recipe adopt all of those characteristics and, when coated in a tangy and tart malt vinegar dressing, their positive flavor attributes are amplified. Toasted hazelnuts add a crunchy component against the soft, sharp nuttiness of the Gouda cheese. Fresh basil not only brightens the dish in flavor but also in color, and the bright green leaves contrast the deep purple-red hue of the main ingredient. It’s not necessarily fair to force foods on people who insist on disliking certain things, but I can’t help but be a little bit pushy when I can guarantee something to be amazingly delicious. 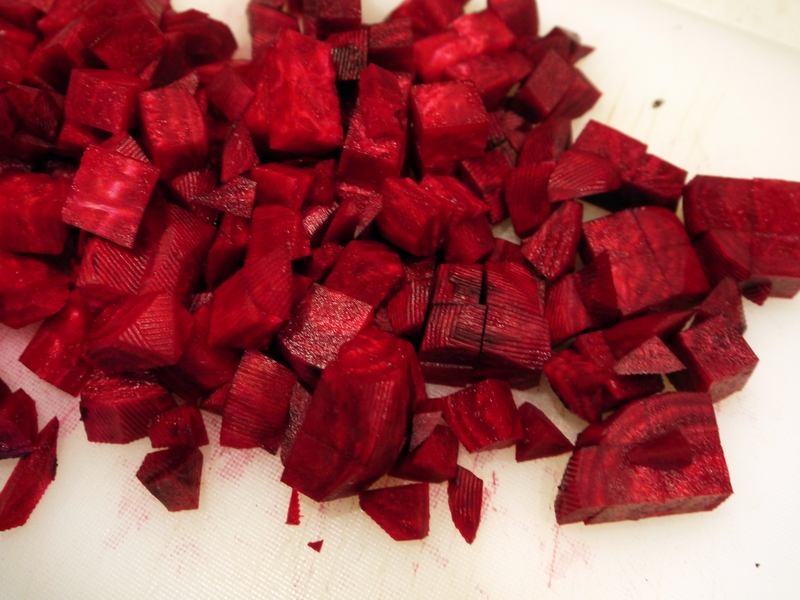 Next time someone confusingly holds up a bunch of beets and asks, “What’s this?” I will sing the praises of the pretty, red root and refer them to this recipe, hoping to sway their perspective and make a beet lover out of them. Beautiful beet salad with toasted hazelnuts, Gouda and fresh basil. together for me?? Looks deelish! Of course! I’m a convert and recently started cooking with beets more often. I think you’d like them! We may even be able to convince the kiddies to dig in, too!